Moving items from one bin to another can be easily completed in OrderTime. A Bin Move allows you to complete the move, record the date in which it was completed, record the quantity. 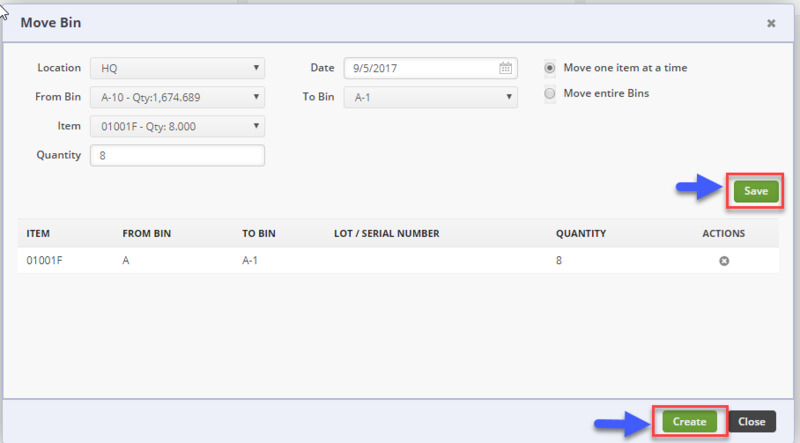 On the OrderTime main page, click on the Warehouse module and select Create New Bin Move section. The Move Bin window screen will open, enter the necessary information to complete the move. Under Location, select the location where the bin move will be completed. Select the bin location from the From Bin drop down menu. The drop down menu will provide a listing of bins along with the quantity at each location. Select the Item from the drop down menu. The drop down menu will provide a listing of items and available quantity. Enter the Quantity to be moved. On the Date, select the date from the calendar. Select the destination Bin from the To Bin drop down menu. You will also have the option to Move one item at a time or Move entire Bins. Your inventory movement will be displayed on the item list. If you wish to delete an item list bin transfer, click on the X under actions. To complete the transfer, click on Create icon at the bottom of the screen. A confirmation screen will display a confirmation for the Move Bin. Click OK to continue.